We recently spent a week on holiday in East Devon and not one to waste an opportunity I persuaded my social secretary that it would be good fun to spend a day visiting some of the villages where my ancestors lived and worked. I didn’t have a lot of information about the actual building and places but wanted to get a "feel" for what the villages looked like. We set off and soon found ourselves on twisty and windy single track roads ("Plymtree is a place that you find yourself in because you want to be there or because you are lost") and usually gravitated towards the churches – in all cases the parish church is the place that I know that they visited for one reason or another and there was a great feeling knowing that my lot had stood there whilst getting married, their children being named or at the end of someone’s life. All the churches had guides for sale – usually on the history of the church and architecture, but I bought one for each church for my family history collection. 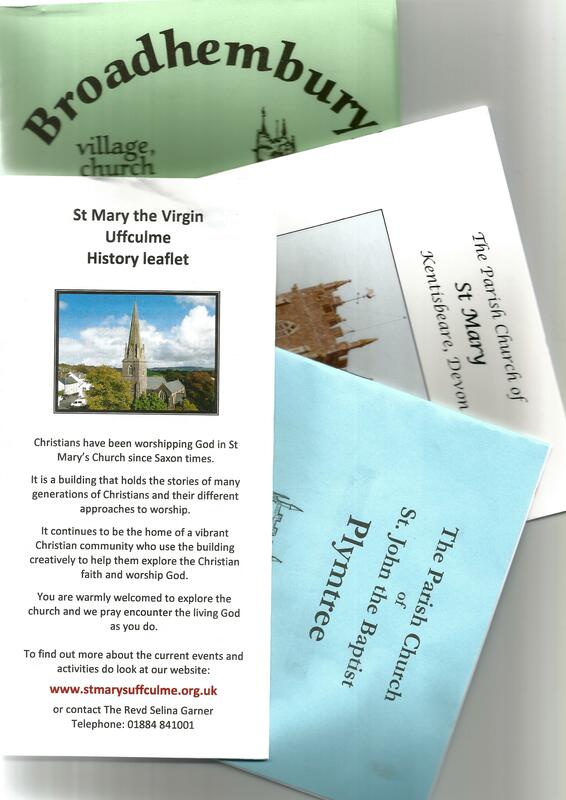 The one for Broadhembury stood out as it also contained information on the village, buildings, local names and also the people who lived there (Rev. Augustus Montague Toplady who wrote the hymn "Rock of Ages" amongst others). There was also a treasure hunt aimed at children young and old (for example "What two things are entwined around the sailor’s gravestone", "What is above the inn sign at the Drewe Arms"). We could have spent all day there (and not just in the excellent pub). If you are lucky to find a walking guide for your place, it can give you such an insight to the odd, curious and unusual – much more than the sometimes bald facts in the history. Search online, ask at the tourist information, look in books of village or county walks, and look for village histories and church guides. If you are lucky to be able to visit your place they can show you things that you wouldn’t otherwise notice. If you are studying from afar then with the help of a map a walking guide can enrich a virtual tour. I’ve never used a walking guide – I prefer just to wander and see where I end up. This would explain why I so often end up hopelessly lost or miles away from where I thought I would end up!